Editor’s Note: The information below is from the makers of Clorox Bleach. We’ve edited it slightly and added a picture. We should tell you, too, that other brands of bleach will work, but you should definitely follow Clorox’s advice and use regular bleach, not the perfumed variety. –Hardly Waite. In an emergency, think of this one gallon of Regular Clorox Bleach as 3,800 gallons of drinking water. Common Laundry Bleach is 5.25% chlorine. That’s 52,500 parts per million. 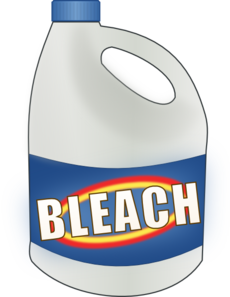 A single gallon of bleach will treat over 3,000 gallons of water! First let water stand until particles settle. Pour the clear water into an uncontaminated container and add Regular Clorox Bleach per the amounts given below. Mix well. Wait 30 min. Water should have a slight bleach odor. If not, repeat dose. Wait 15 min. Sniff again. Keep an eyedropper taped to your emergency bottle of Clorox Bleach, since purifying small amounts of water requires only a few drops. See below suggestions for storage bottle replacement. Don’t pour purified water into contaminated containers. To sanitize water jugs first, follow the instructions below. Whether you use Clorox Bleach in an emergency or for everyday chores, it’s always an environmentally sound choice. After its work is done, Clorox Bleach breaks down to little more than salt and water, which is good news anytime. See also, A Practical Guide To Emergency Water Filters.